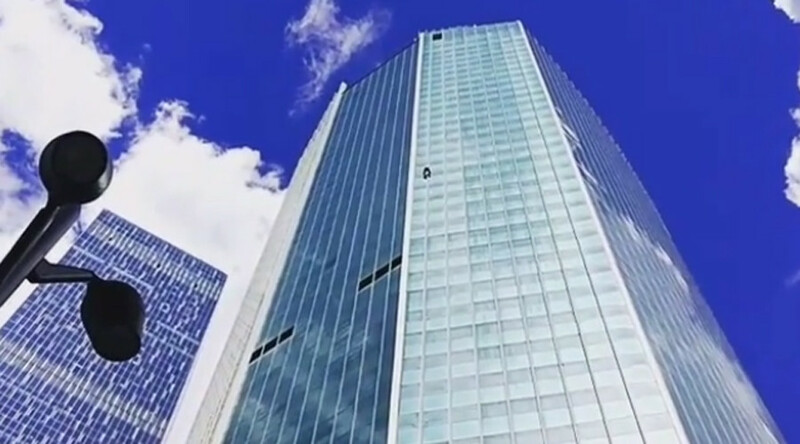 The self-styled "Russian Spiderman" conquering a 72-story building in the capital’s Moscow City business center has been met by police and emergencies services on the rooftop. The stunt was filmed by his friends, who were raising money for an inevitable fine. “I’ve been [climbing tall buildings] for seven to eight years now,” Sergey Devlyashov told Life as he walked out of a police station, where he was charged with an administrative offense and handed a fine. “But this is my first skyscraper. Before I’d only climbed buildings as tall as 40-45 floors,” Sergey added. Dozens gathered to witness the climbing stunt once Devlyashov began ascending the 309-meter-tall (1,013 feet) Eurasia Tower on Sunday. The entire event, broadcast live on YouTube, raised the alarm among the authorities, who rushed to help the climber make it to safety. Emergency Ministry units arrived at the scene and lowered safety ropes when he had already conquered over 30 floors. Devlyashov, however, declined to accept or use the lifeline. Rescuers also lowered a bucket of water so that Devlyashov could climb to the top of the building. Despite headlines in the Russian media claiming the "Spiderman" was climbing with no gear, Sergey revealed he had been using the harness to let his arms rest. He was also said to have had water given by emergency workers who were awaiting him on the roof, along with police officers.